Of course, I would not know how to operate without the assistance of my helpful staff! Here, our CEO Ozzie is checking out the acorns for proper spin. You never know when you might need to spin an acorn! Option One…Write the name of your guests on the faux leaves using your Sharpie and top with a mini pumpkin…easy! Just arrange them on the napkins at each place and voilà! Or for another spin, place the napkin between the salad plate and the dinner plate and place the leaf on the plate…simple but pretty! Option Two…Punch holes in one of the leaves and in a chalkboard label. Tie around the napkin using jute twine. Add the names of your guests last since the chalk tends to smear. The chalkboard labels are sticky on the back but they don’t seem to stick very well to the leaves so the twine solves that problem. Option Three…Place the chalkboard labels on note cards, letting the sticky side adhere, and cut around them. Punch holes on each side and thread a piece of jute twine through the holes, tying knots to hold it in place. Add your guests’ names and hang around a mini pumpkin. I placed one of the leaves underneath to give it a little more presence on the napkin. Option Four…Make the chalkboard tags following the directions for Option Three and hang them around the little pinecone turkeys. Add them to the napkins at each place. 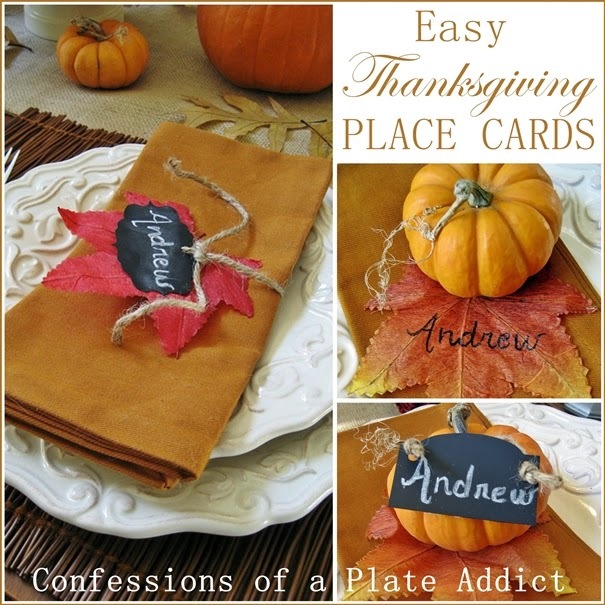 And there you have it…some fun options for making place cards for your Thanksgiving table…all from the same materials! Now I just have to decide which one I like the best and add them to my tablescape before I reveal it! Do you have one you like best? Thanks for stopping by! I hope you enjoyed a little peek at my Thanksgiving place cards! Please visit these wonderful bloggers and their beautiful blogs to see what they are up to and to find a list of this week’s participants! These are really cute, Deb. I especially like the 'leaf' one. It looks easy and has a great effect. Cute ideas, for me it is a toss up between the leaves and the chalkboards. What a cute idea Debbie! We are still trying to figure out what we are doing for Thanksgiving, but if we decide to stay home I would love to make some of these! cute, cute cute....too hard to pick just one. I'm impressed you had mini pumpkins in your junk drawer (lol)..yours is much better equipped than mine. :) Love those turkeys...wish we had a Cost Plus here. I like the leaves under the pumpkin best, then my second favorite is the leaves on the napkin. Very cute! This Thanksgiving, I'm thankful that I'm not hosting! Great ideas for place cards!!! I have those same faux leaves! We host Thanksgiving next year here On Crooked Creek...bookmarking this post!!! Thanks for sharing! Debbie, They are all so cute! Thanks for sharing these at the Open House party and look for your place cards to be featured this week. Hey Debbie! Your ideas are soooo awesome! I totally love that natural place card for thanksgiving, so wonderful! Thanks for sharing, Here's expressing my best Thanksgiving wishes to you and your family and i hope you will have a fun-filled and blessed thanksgiving celebration! Thank you, thank you, thank you. What cute place card ideas and they can be adapted throughout the year for all seasons. Happy happy gobble gobble Thanksgiving.